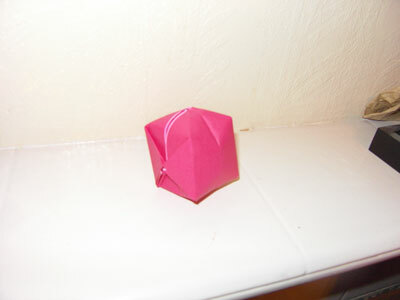 The origami water balloon is a traditional origami and a well-loved one, judging from the amount of photos we've received from our readers! The photos have overflowed the original page and we've them here instead. Thank you to our reader, Birch-Lily from Waldwick, who submitted this photo to us! Reader's comments: Easy and fun, best made of newspaper if left empty. 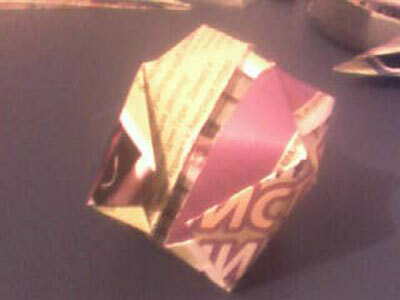 Do not i repeat Do NOT fill when made of newspaper. It will leak and it will not be pretty. Thanks to another reader who submitted the photo below. " 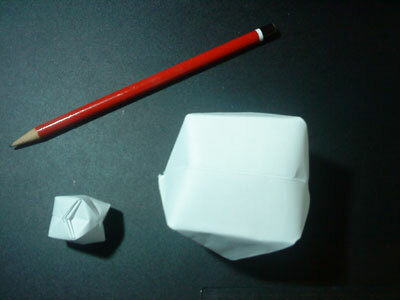 This is my origami balloon,made using your instructions and a blank sheet of white printer paper that I cut into a square. " 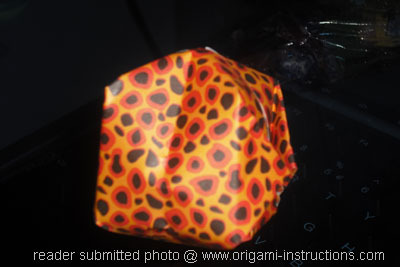 Thanks to reader Devin from Lowell for his leopard print origami water balloon! 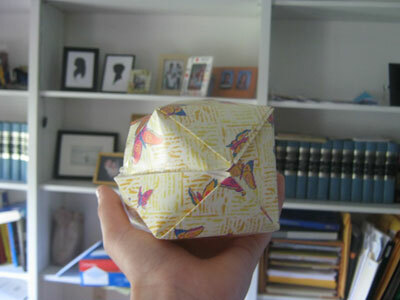 - " This is a fun origami balloon to do. 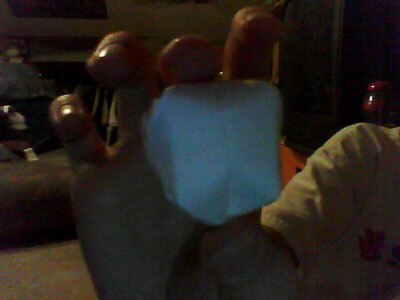 One time I had filled it with water, but then got very leaky. 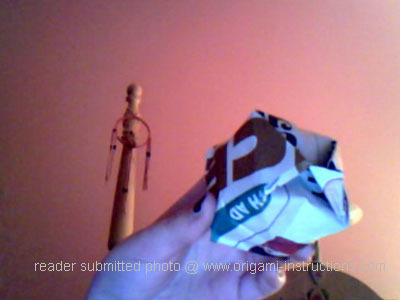 I used my origami paper from my origami animal kit." 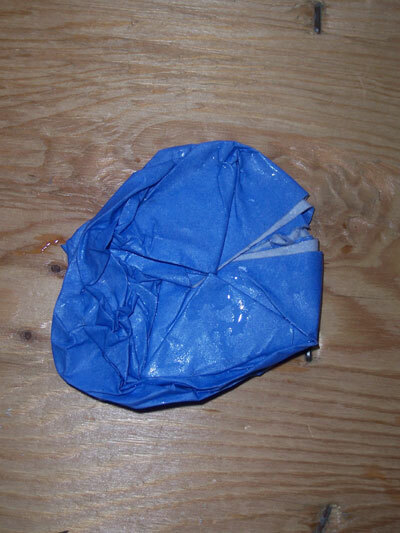 From reader in Newcastle "My first attempt at doing a water balloon. 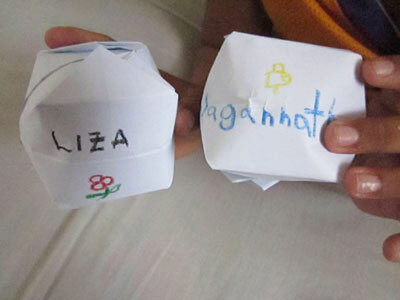 think it turned out pretty good"
From Lizzie "Water Balloon: I love this!" From Sage in Kelowna "My first water balloon. So much fun!" 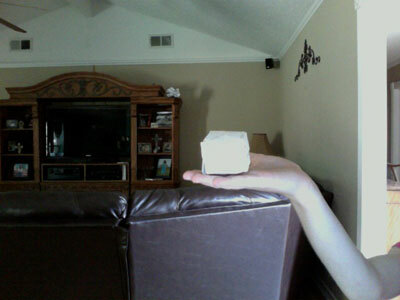 From Andrew in Peoria " This is the smallest water bomb I have ever made/seen. 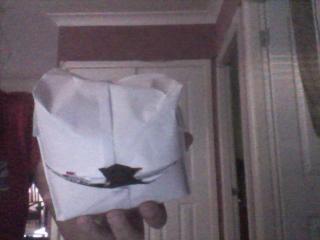 I made this using only my hands. The penny is to compare. 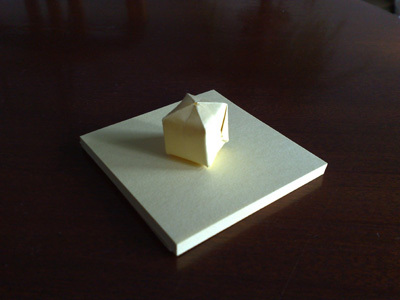 I am very proud of this piece and I think it one of the smallest ever made. " 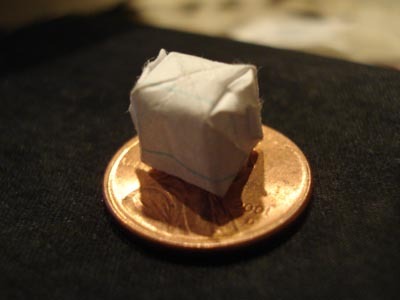 Wow, that is one tiny origami water balloon! 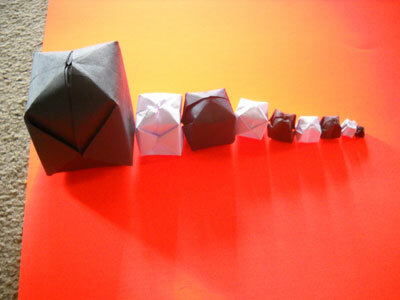 From Luz in Madrid " For making a lamp. 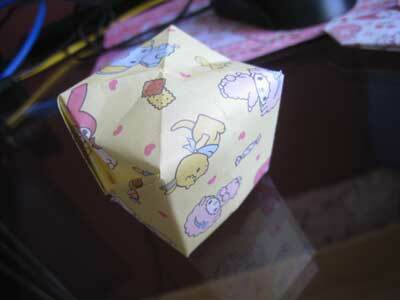 I used a sintetic transparent fabric, and some glue since the folds didn't hold. 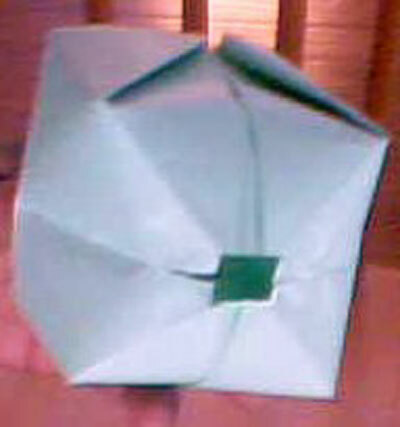 Two crosed chopstics add some resistance to the structure. The drawing was traced with some markers. Thank you so much for the instrutions and inspiration. " 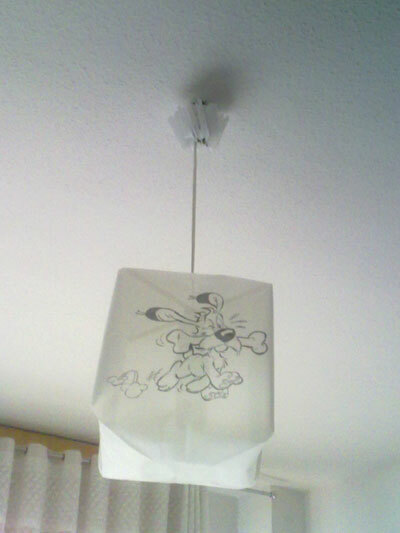 Wow, that's really creative, Luz! From reader in Wilmot " this is what happens when you throw it at someone and it has water. " 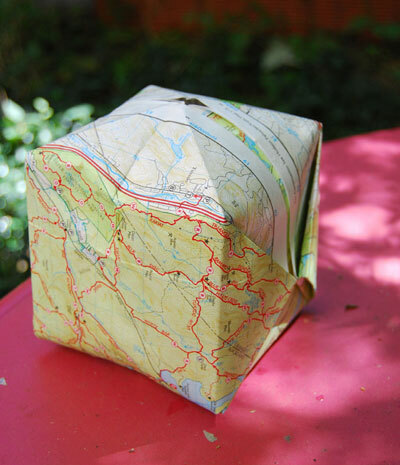 From Seb in New York " The material use for new topographical maps is waterproof. 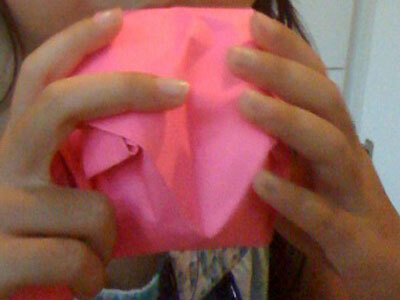 It is called Tyvek. This is perfect for the water balloon! " 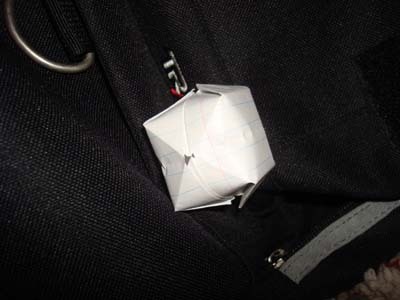 That is one high tech origami water balloon, Seb! 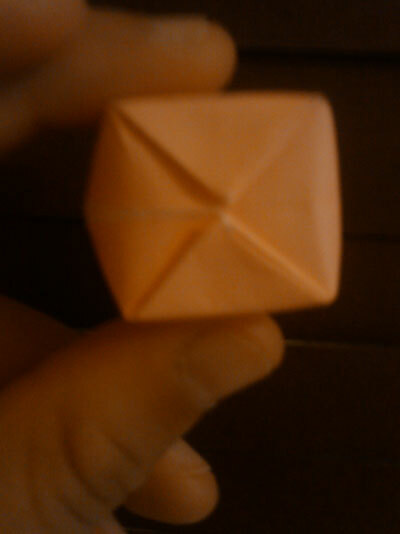 From Anne-Marie in Middlesex " It's only hardly bigger than the pen-tip, and it took nearly 2 minutes to do! 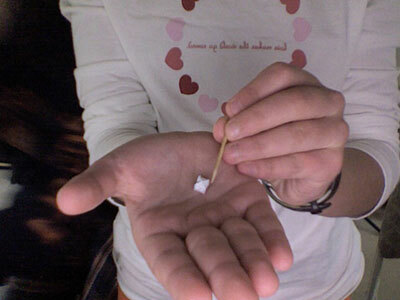 A tip: when doing small versions of origami, use a toothpick instead of your fingers, it is so much easier! This is a water balloon. " Thanks for the tip, Anne-Marie! 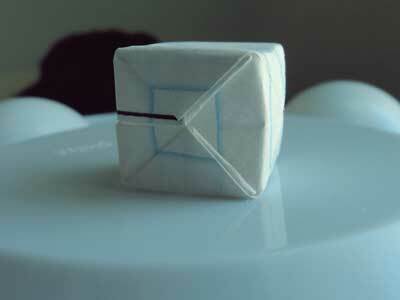 It's so tiny that if you hadn't told us it was a water balloon, we wouldn't have known! From Edgar in Queluz Portugal " Water balloon made with a yellow post-it "
From Loki in Summerland Point " I am pretty sure that this is one of the biggest water bombs ever made!! " 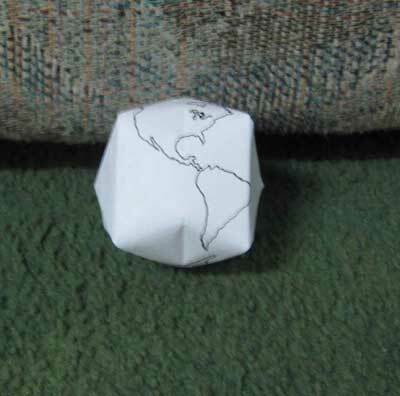 From reader in Houston " This is a water balloon, with the continents drawn on it, making it a foldable globe. It has Antarctica, Asia, Europe, Australia and N. and S. America appropriately placed, showing that South America is mostly east of North America, and the creases at the top and bottom of the main box part, are halfway between the equator and the poles. " 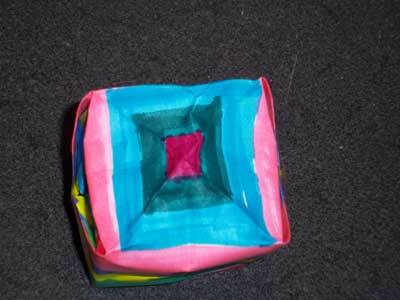 From Taylor in Elkville " I was bored, so i was coloring on a piece of square paper and decided to go to your site. i saw the water balloon. 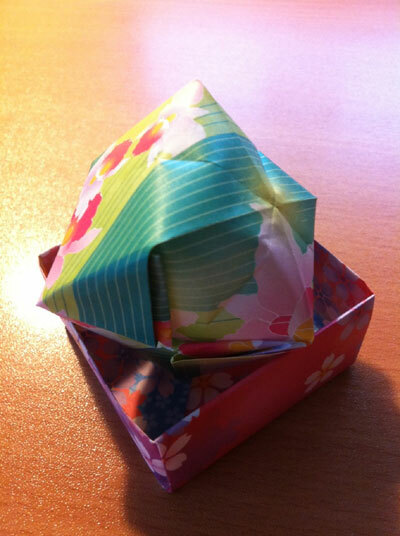 i made it and it turned out very pretty. " 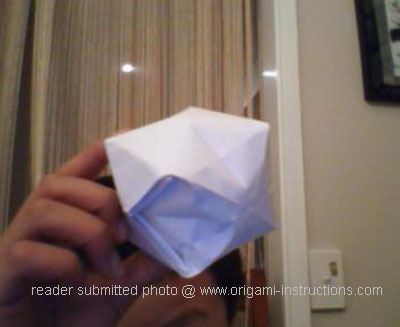 From Arizona in Sherbrooke " Origami Water Balloon i made, it was really easy and fun to do. it was the size of my thumbnail!" 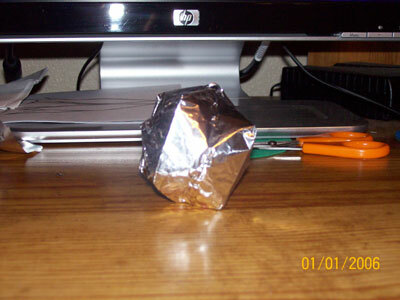 From Cory in Cabool "This is my Origami water baloon,i made it out of tin foil,pretty neat looking,and dosnt leak as much!Love it and this site Thx!!!" 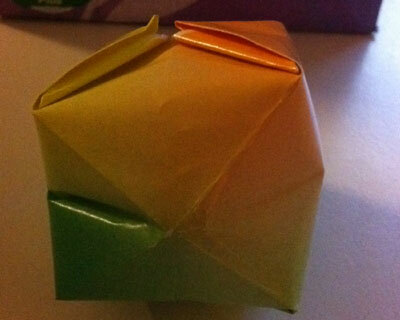 From a reader " This is my origami water bomb!! i actually made it while watching TV.... it's only 4mm!! 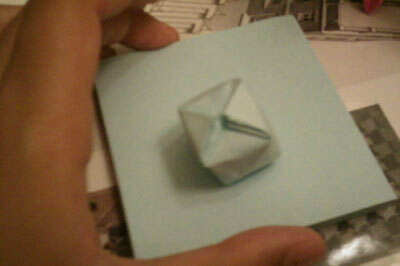 smallest I've ever made!! " 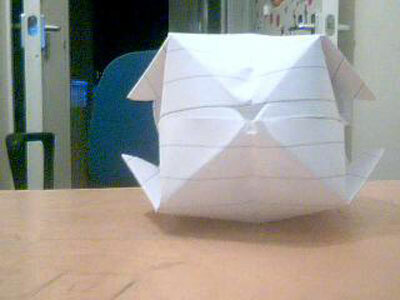 From Eric in Cincinnati " made this in 20 seconds with craola origami paper.. has been used twice! " 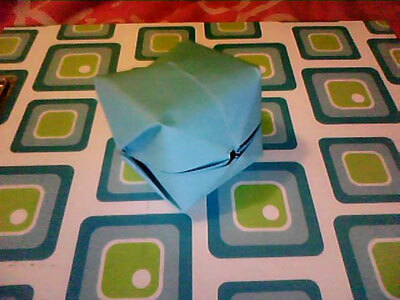 From Jenya in California " AWESOME WATER BOMB- This was my first try at making a water bomb. 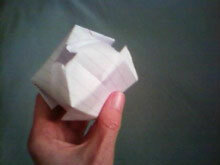 It was really fun and easy to make! 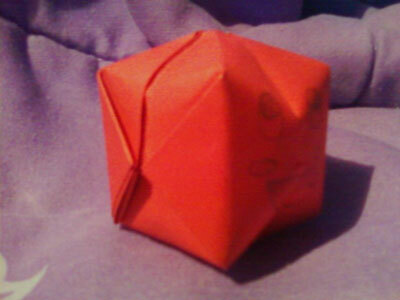 :D "
From Autumn in Aledo " I tried this before.......turned out horrible. 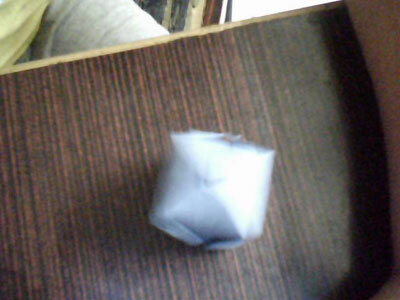 Tried it again it was hard but i did it. " From reader in Hesperia " I love this water balloon. It's so cool! " 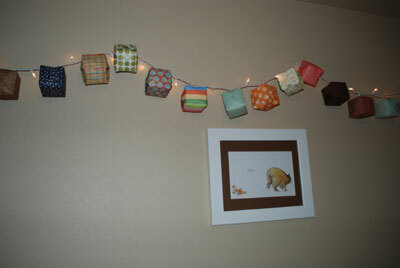 From reader in Severance " There are 17 paper balloons attached to a short string of lights. My daughter uses this as her night light. " 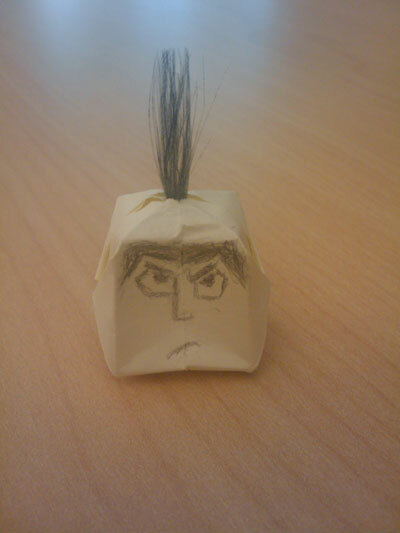 From reader in Saint Charles " origami water balloon: it's samurai jack. the hair is made of feather colored black with a marker. " 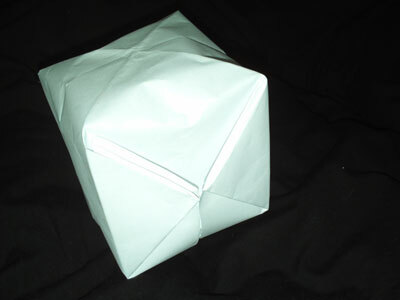 From Mani in Bradford " This is my water balloon origami made from my maths revision notes (A3) and is the size of my hand and has been reused 8 times "
From Aiden in Mesa " Origami water bomb made from a blue post it. 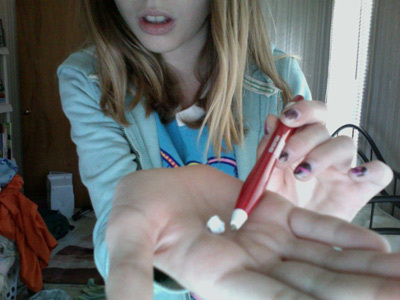 I already knew how, but I forgot one part. Your instructions were different, but they were alot better. " 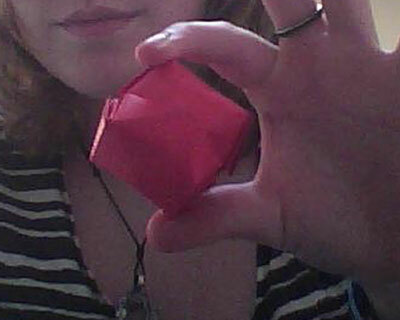 From reader in Gold River " This is my water bomb! 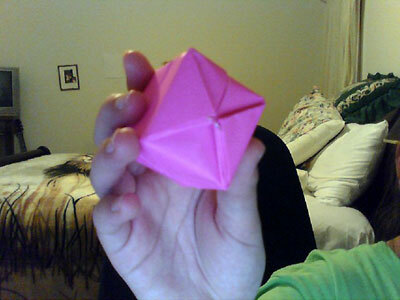 I havent made one of these since 5th grade! 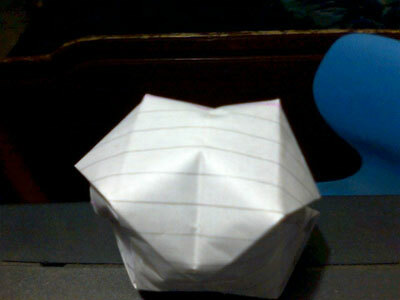 ;o) "
From Bams in Trivandrum " It was easy making this origami balloon. 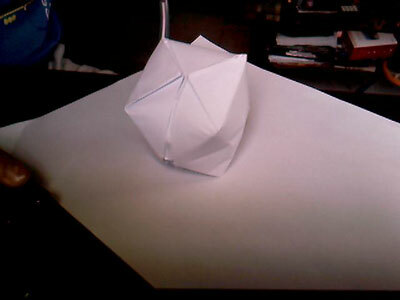 I just wanted to try it out so made it out of plain paper. " From Missy in Roscoe " Hi! 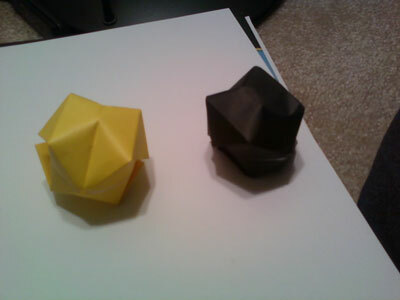 I decided to do different colors and different sizes. 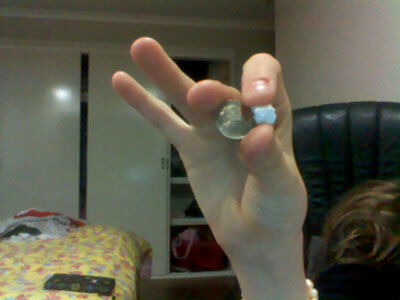 The smallest is smaller than my pinkie nail and the biggest is about the size of two hands. 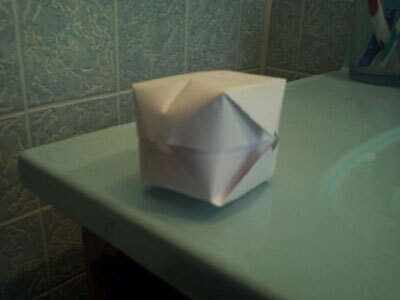 :) "
From Nat in Cavite City " Origami water balloon, made by an 8 yr old kid "
From Haley in San Francisco " My friend Julia and I had great times in elementary school making these water bombs and throwing them at the stupid boys. 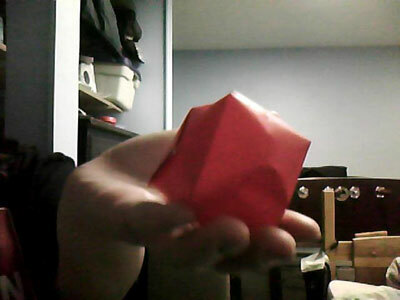 Made out of plain red origami paper. " From Jamie in Gold Coast " This is one of my balloons it's about 4 mm long and i actually made a smaller one but it's lost some where on my desk it was about 2mm long." 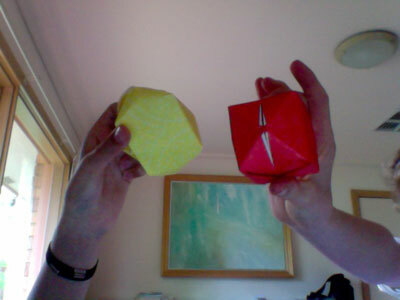 From Fred in Melbourne " It was very fun making these colourful balloons. " From Elizabeth in Vancouver " I have been making a lot of the and I just wanted to experiment with the way you guys did it." 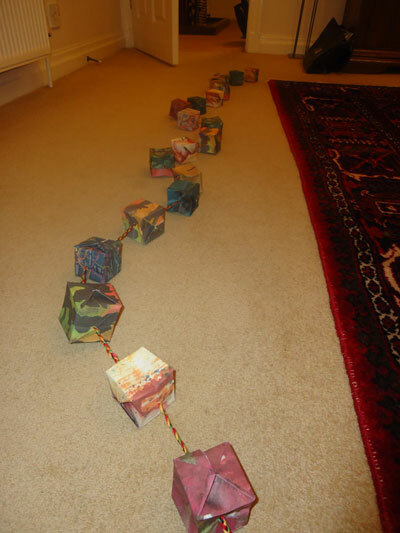 From Sophie in Bolton " I made these origami inflatable cubes for my textiles art work at uni and am so happy with them! " 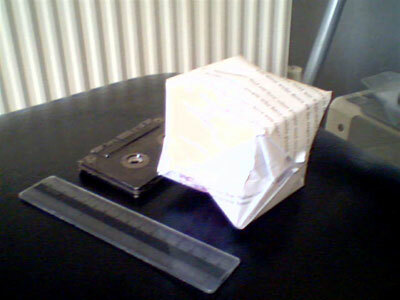 From reader in Gent " Origami Balloon, pencil is used for letting you know how big they are."